Monday morning greetings from a warm and cosy Hampshire home (and no longer a cold, damp tent!). I've just returned from my wanderings at Latitude Festival in Suffolk where I've been for the past five days. What a wonderful festival! Did anyone else go? If you did, I hope you came down to The Faraway Forest to see the daily spectacle that was The Painted House! I was there on Friday afternoon with my showcase of ethnic fashion finds from around the globe and a couple of traditional Indian woodblocks - which all the kiddies seemed to enjoy making a mess with! I was lucky enough to meet some lovely London based creatives such as Victoria from Rag & Bow's Roaming Vintage Store, London College of Fashion design graduates Gloria-Yi Ling and Fernanda Yumi Fujiwara, Out There Magazine's David Hawkins and illustrator Nina Chakrabarti. 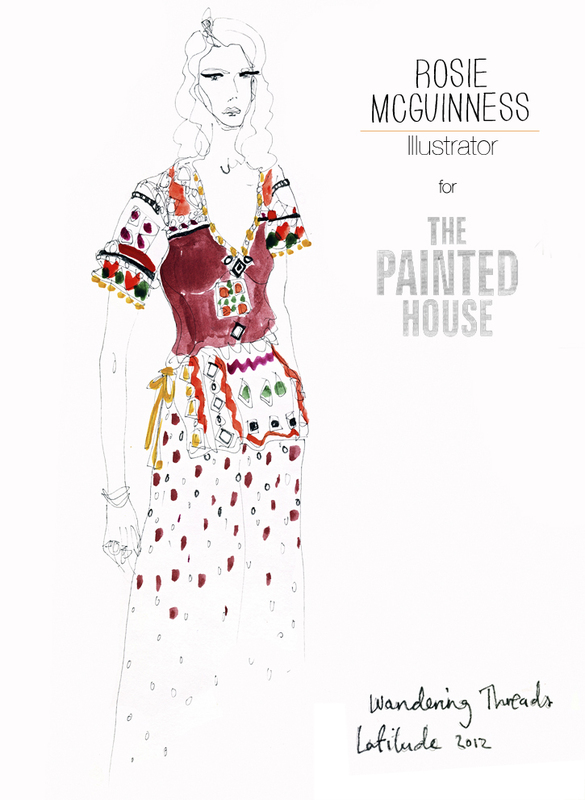 Excitingly, I also got to meet super talented fashion illustrator Rosie McGuinness who captured me in my infamous Rajasthani gypsy blouse and hand block printed Indian maxi skirt, as pictured above. There'll be lots more Latitude related content coming soon, so watch this digital void. But for now I'm off to de-soggify my tent and scrub the mud off my boots! Fantastic illustration. Latitude was great as was the Painted House and Wandering Threads show case. Keep up the great work.